Figure 6.1.1 shows the screen that opens after clicking Tasks → Cron Jobs → Add Cron Job. Table 6.1.1 summarizes the configurable options when creating a cron job. Created cron jobs will be listed in View Cron Jobs. Highlight a cron job entry to display buttons to Edit, Delete, or Run Now. 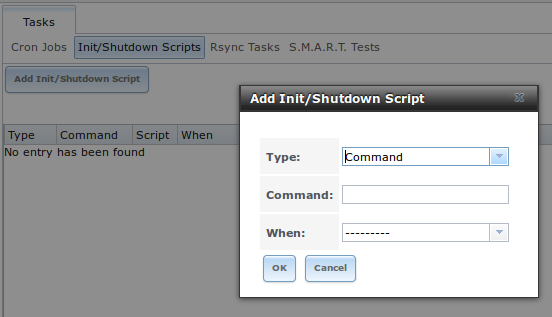 Figure 6.2.1 shows the screen that opens after clicking Tasks → Init/Shutdown Scripts → Add Init/Shutdown Script. Table 6.2.1 summarizes the options. When scheduling a command, make sure that the command is in the path or give the full path to the command. One way to test the path is to type which command_name. If the command is not found, it is not in your path. When scheduling a script, make sure that the script is executable and has been fully tested to ensure that it achieves the desired results. Rsync is a utility that copies specified data from one system to another over a network. Once the initial data is copied, rsync reduces the amount of data sent over the network by sending only the differences between the source and destination files. Rsync can be used for backups, mirroring data on multiple systems, or for copying files between systems. Rsync is single-threaded, so gains little from multiple processor cores. To see whether rsync is currently running, use pgrep rsync from the Shell. FreeNAS® can be configured as either an rsync client or an rsync server. The opposite end of the connection can be another FreeNAS® system or any other system running rsync. In FreeNAS® terminology, an rysnc task defines which data is synchronized between the two systems. To synchronize data between two FreeNAS® systems, create the rsync task on the rsync client. rsync module mode: exports a directory tree, and its configured settings, as a symbolic name over an unencrypted connection. This mode requires that at least one module be defined on the rsync server. It can be defined in the FreeNAS® GUI under Services → Rsync → Rsync Modules. In other operating systems, the module is defined in rsyncd.conf(5). Figure 6.3.1 shows the screen that appears after selecting Tasks → Rsync Tasks → Add Rsync Task. Table 6.3.1 summarizes the options that can be configured when creating an rsync task. If the rysnc server requires password authentication, input –password-file=/PATHTO/FILENAME in the Extra options box, replacing /PATHTO/FILENAME with the appropriate path to the file containing the value of the password. To finish the configuration, start the rsync service on PULL in Services → Control Services. If the rsync is successful, the contents of /mnt/local/images/ will be mirrored to /mnt/remote/images/. FreeNAS® supports RSA keys for SSH. 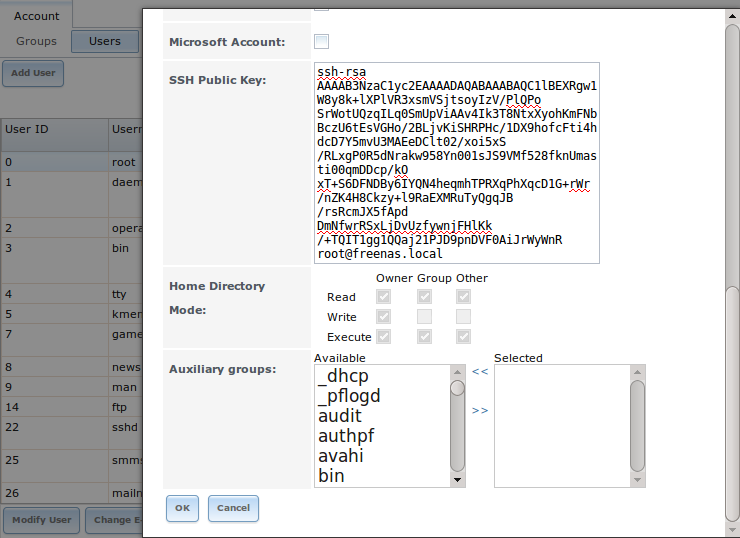 When creating the key, use -t rsa to specify this type of key. Go to PULL and paste (or append) the copied key into the SSH Public Key field of Account → Users → View Users → root → Modify User, or the username of the specified rsync user account. The paste for the above example is shown in Figure 6.3.2. When pasting the key, ensure that it is pasted as one long line and, if necessary, remove any extra spaces representing line breaks. While on PULL, verify that the SSH service is running in Services → Control Services and start it if it is not. S.M.A.R.T. (Self-Monitoring, Analysis and Reporting Technology) is a monitoring system for computer hard disk drives to detect and report on various indicators of reliability. When a failure is anticipated by S.M.A.R.T., the drive should be replaced. Most modern ATA, IDE, and SCSI-3 hard drives support S.M.A.R.T.–refer to the drive documentation for confirmation. 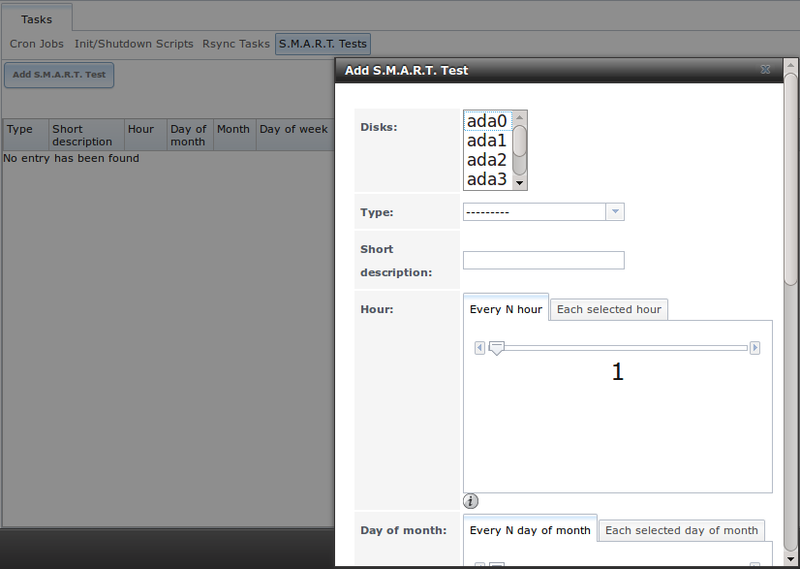 Figure 6.4.1 shows the configuration screen that appears after selecting Tasks → S.M.A.R.T. Tests → Add S.M.A.R.T. Test. Tests are listed under View S.M.A.R.T. Tests. After creating tests, check the configuration in Services → S.M.A.R.T., then click the slider to ON for the S.M.A.R.T. service in Services → Control Services. The S.M.A.R.T. service will not start if there are no volumes. Table 6.4.1 summarizes the configurable options when creating a S.M.A.R.T. test. An example configuration is to schedule a Short Self-Test once a week and a Long Self-Test once a month. These tests should not have a performance impact, as the disks prioritize normal I/O over the tests. If a disk fails a test, even if the overall status is Passed, start to think about replacing that disk. If an email address is entered in the Email to report field of Services → S.M.A.R.T., the system will send email to that address when a test fails.